On 13th of May 2001, when the entire state of West Bengal was experiencing the euphoria of change, the landscape of Bengali theatre also changed forever. Badal Sircar, the maverick of Indian theatre, passed away almost unnoticed. But I am not going to write an obituary of Badal Sircar, neither I am going to write his biography. Rather I’d like to share with you my experiences with this theater personality through his work and from few of my personal interactions with him. My first experience with Badal Sircar was when I was a child. In our campus (I grew up in IIT Kharagpur campus) the faculty, staff and students often staged plays and I think it was with “Boro Pishima” I first experienced theatre and it changed my life in many ways forever. Later I saw “Solution X” where my mother also participated in one of the lead characters. Few years later, when I was in high school, I went to see a student’s production (TDS _- Technology Dramatic Society) and was shaken to the core to see “Michhil” performed. It was an experience that I could never have expected. For the first time I realized that theater does not require a stage, does not require any expensive sets, any lights or any sophisticated sounds. All it needs are performers and an audience. And in most cases, the barrier between a performer and audience faded away – they became one whole theatrical entity. I also learned the term “Third Theatre”. The apparent simplicity of these production made me think, can theatre be so easy? My friends and I started to produce Badal Sircar, “Michhil”, “Bhoma” and others. We even started performing regular proscenium kind of plays in third theatre form. After I joined IIT as a student, my involvement with TDS became more strong. Badal Sircar was the rage those days. Several groups were performing Badal Sircar – “Spartacus”, “Bhoma”, “Sukhopathya Bharoter Itihas”, “Hatta Malar Opare” and not to mention his proscenium plays like “Jodi Ar ek Baar”, “Baaki Itihas”, “Pagla Ghora”, “Ballabhpurer Rupkatha”, “Ebong Indrajit” – we couldn’t have enough of Badal Sircar. One of our seniors was a regular performer in Badal Sircar’s group Satabdi, and he often would bring fresh new plays to the campus. Badal-da himself often came to the campus. Sometimes with his group Satabdi to perform, sometimes to conduct workshops with the students. I still remember the experience of watching “Spartacus” performed by Satabdi on our Basketball court. It was then I realized how far our productions have been from their true potential. And then when I joined Badal-da’s workshop (conducted on our open air theatre stage), I realized how wrong I was in thinking that his productions were easy to perform. How much one needs to train himself, train his mind and body to not only perform, but also to become an integral part of theater. While working with us on some of the trust games during the workshop he mentioned, “The key aspect in theatre is to have complete trust on your co-performer. You should be able to take the greatest risk, either physical or emotional, fully trusting that your co-performers are there to support you. Until you develop that relationship with your team mates, you can never give your 100% to theatre.” This lesson stuck with me all along. I realized, that this is not only true for theater, but also for each and every aspect of our life, our family, our work, our society. Some of the other workshop exercises taught me several aspects of using space, dynamic compositions – creating new stage pictures, breaking them instantly and then recreating them almost organically. It taught me, how versatile is this instrument of acting we have – our own body. How we can create not only human characters, but also physical objects and properties and infuse life in them with our body and mind. A desk and a chair created by human bodies, no longer exists only as a mere objects in space, but carries with them a deeper meaning that is truly human. Later, I have moved away from Badal-da’s form of theatre for many reasons. One of them was the fact that I didn’t feel we were doing justice by performing “Third Theatre” in a proscenium environment. Third theatre can never succeed on a stage within three walls with the audience sitting fifty meters away behind the fourth wall. We were cheating ourselves, and defeating Badal-da’s primary reason for developing this form. I’d rather not do such theater and stick to the conventional style. Maverick’s are rare in our society – not everybody can traverse the trailblazing path that people like Badal Sircar can tread. But the lessons I learned from this great master would always show me my path during the difficult times in my theater life. 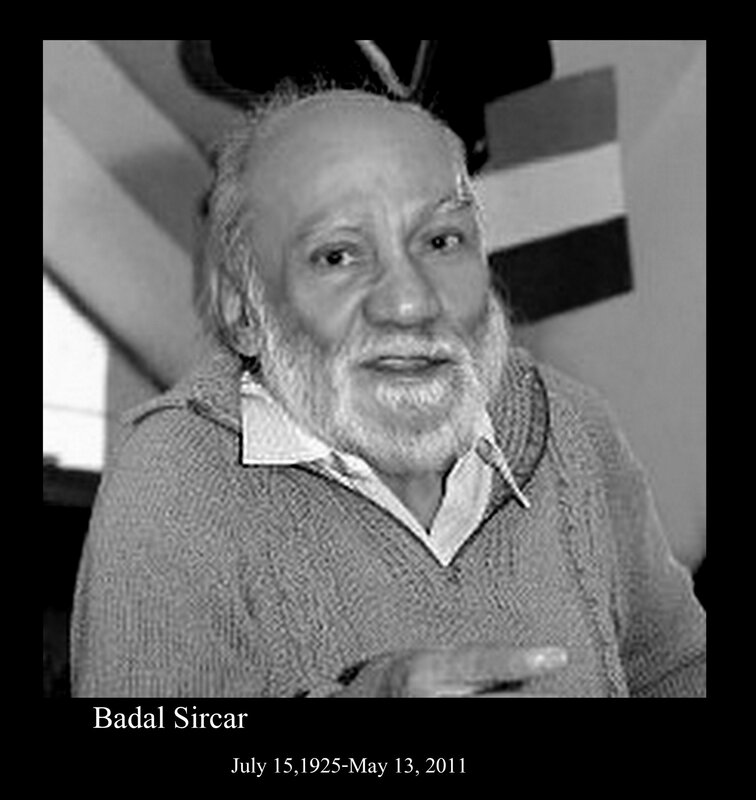 On Saturday June 4th at 2.00pm, a memorial service for Badal Sircar has been organized by his protege, Subhashis Das at the Woodbridge Library, George Frederick Plaza, Woodbridge, NJ 07095. It is unfortunate that I won’t be able to make it due to my rehearsal commitments, but I hope Badal-da would pardon my absence for the sake of theatre.